This unique process is based on research by the Center for Mindful Eating and Mindfulness guru Dr. Ronald Siegel. This explores the question we often ask ourselves, why am I eating if I'm not even hungry? In this series, you'll not only enjoy 4 weeks of coaching but product samples and cooking demonstrations of healthy foods that you may not have tried before. This 4-week class can be provided to you in my office or by phone or Skype session should group format not be desirable. Sessions are $60.00 each or 4 1 hr sessions for $200.00 paid in full at first session. Should you have a group of friends who are interested in going through the program together, contact me and we can discuss group rates that are fun, interactive and enriching! See testimonials below. 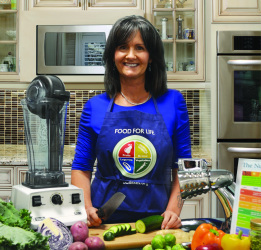 Certified Food for Life Plant Based Nutrition Educator. Click on the site below to see other healthy happenings in the St. Louis area. I am so pleased that I am treating myself to this program with Charli. This program has given me the tools to completely change the way I look at food. I no longer want to eat until I'm stuffed because I've learned what full feels like! I have lost 8 lbs. in roughly 8 weeks and I have never once felt hungry. The best part is, I don't really want to eat sweets now. I choose healthy foods because they actually taste better. As a pharmaceutical rep, my schedule is packed with a lot of travel. Individual phone sessions with Charli were a big help to me although I do wish I could have been part of the tasting session. This is the best"non-diet" I've ever been on. Lori Palmer, Carterville, Illinois. Individual phone coaching participant, Winter 2013. At 56, I still enjoy running marathons several times a year. I log over 40 miles most weeks. Running was becoming increasingly difficult and injuries were no doubt my future as I started to pack on middle age weight. Not only did Charli change the way I look at food as fuel, she taught me how to increase my energy with healthy cooking tips. She even taught me how to make my own energy shots out of cacao nibs, lemon zest, agave and dates. Okay, she actually makes the shots for me. Even though I have to be honest here and admit she's my wife, I can still say that this program and her ability to gently nudge me into a healthier relationship with food is the best gift she's ever given me. Lee Levinson, St. Louis, MO.